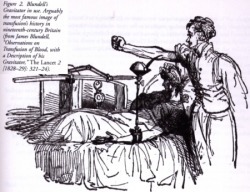 It was a cold December night, 1818, when doctor James Blundell successfully transferred 14 ounces of blood, collected from several patients and reintroduced to a sole, "incurable" patient, at the medico-chirurgical society in London. Blood was both collected and distributed by a syringe. The patient who recieved the blood survived for almost a week longer than expected before finally dying. It was then that doctor Blundell saw the significance of blood transfusions. Only a few days later, Blundell designed a device called an impellor which pumped blood into a funnel leading to a patient's bloodstream. The gravitator (seen below) was then developed as a more efficient device for the transfusion of blood. Blundell was able to prove that a small amount of air bubbles in the blood are not fatal as thought previously by doctors and surgeons from around the world. 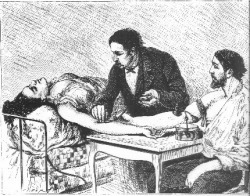 In 1853 the invention of the hypodermic needle, a syringe with a hollow point, developed by Alexander Wood increased the efficiency and ease in which blood transfusions were conducted. However, despite the large break through there were some obstacles that were very difficult for 19th century surgeons to overcome. For instance, transfused blood would coagulate and could therefore not be used. In 1883 sodium phosphate was introduced as an anticoagulant and the four individuals it was tested on died consequently. No anticoagulants were found to be effective until World War I. Furthermore, blood transfusions became much more effective, especially less deadly, after different blood groups were discovered in 1901. However, transfusions were only used in times of desperation, thus the procedure didn't kill anyone who wasn't already doomed. In some cases, blood transfusions helped women during child birth, much like the way they are used today. Click here to give blood and find out how modern-day transfusions work and who benefits from blood drives!